Part 1 Traceability, safety and quality: Developing traceability systems across the food supply chain: An overview; Using traceability systems to optimise business performance; Optimising supply chains using traceability systems. Part 2 Building traceability systems: Modelling food supply chains for tracking and traceability; Dealing with bottlenecks in traceability systems; Including process information in traceability; Traceability of analytical measurements. Part 3 Traceability technologies: DNA markers for animal and plant traceability; Electronic identification and traceability of farm animals; Storing and transmitting traceability data across the food supply chain; The range of data carrier technologies for food traceability. In the light of recent legislation and a number of food safety incidents, traceability of food products back from the consumer to the very beginning of the supply chain has never been so important. This important book describes key components of traceability systems and how food manufacturers can manage them effectively. 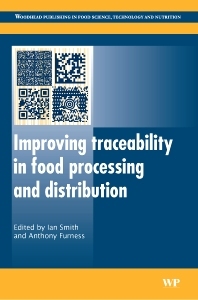 After an introductory chapter on the nature of traceability systems, the first part of the book reviews the role of traceability systems not only in ensuring food safety but in optimising business performance. Part two looks at ways of building traceability systems, with chapters on modelling, identifying and resolving bottlenecks in traceability systems, including process information and tracing analytical measurements. Part three reviews key traceability technologies such as DNA markers, electronic tagging of farm animals, ways of storing and transmitting traceability data and the range of data carrier technologies. Improving traceability in food processing and distribution is an important reference for QA staff in the food industry in meeting regulatory requirements and improving the safety and quality of food products. Ian Smith is Managing Director of the UK Division of AIM (Association for Automatic Identification and Mobility), internationally-known for its work in developing traceability technologies for industry. Formerly at the University of Central England in the UK. Professor Tony Furness is Technical Director for AIM UK.